The British road network covers more than 200,000 miles. While we might take our roads for granted, it has taken a considerable period of time to build the country's road infrastructure. In this article we take a look at the history of the British roads, from Roman times to our days. Although there is evidence of timber roads being built in Norfolk during the first century B.C., the arrival of the Romans to Britain marked the start of the country's road network. More than 2,000 miles of paved roads were built during the period between 43 and 410 A.D., most of which were used for military and trade purposes. London was chosen as the centre of the Roman road network, as six roads originated there and linked the city with Dover, Chichester, Carlisle, York, St Edmund, and the west of the country. The original layout of some of these roads has been preserved to our days, and parts of the A2, A257, A30, A15, and A24 follow the course of the first roads built in Britain. During Roman times, the road network in Britain was divided into the six core roadas mentioned above and a number of minor roads that were built exclusively for commercial purposes. These covered large parts of East Anglia, Kent, and Sussex. The road network increased its extension and its capacity as trade and commerce gained importance during medieval times. The majority of our modern day drovers roads date from this period too. 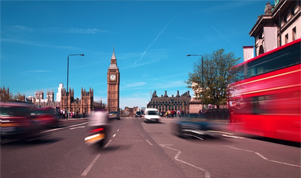 Due to a Parliament Act that came into effect in 1633, road users began to be charged for using the British roads. The revenues generated were used to improve maintenance, and this in turn benefited manufacturing towns as they were able to transport their products faster. During the Industrial Revolution, the amount of money invested in the national road network increased to over £3 million each year. In only seventeen years, more than 3,000 miles of roads were added to the network. The first motor vehicles to use the British roads did so towards the end of the 19th century, although before the turn of the new century there were no more than 20 petrol-powered cars in the country. This period also saw the start of motoring taxation, which was mostly implemented to keep the roads well maintained under the pressures of increasing traffic. Road numbering and classification also date from this period. Long-distance motoring started to be popular during the 1930s. This fact led to a need for motorways, the first of which was inaugurated in December 1958 at the Preston Bypass. The AA also began to assist motorists in 1958. The first motorway in the UK was only an 8-mile long stretch of road, but it was soon followed by the construction of the M4 Chiswick flyover and the M1, which at 67 miles was the country's first intercity motorway. By the early 1970s, the national road infrastructure had grown to include dual five-lane roads, four level interchanges, and high level viaducts. The reflective safety devices known as cat's eyes were invented in Britain and soon began to be seen in other countries around the world. The first cat eyes were designed by Yorkshire inventor Percy Shaw and were first manufactured in Halifax in 1935. The objective of these devices was to improve road safety during the common blackouts experienced during the war. The usefulness of these devices became evident soon, and following the war, the Ministry of Transport supported the mass production of cat's eyes. The use of number plates was introduced in the United Kingdom in 1904. This requirement was linked to the Motor Car Act of 1903, and its objective was to facilitate the tracking of motor vehicles in the event of an accident or an infraction. The UK became the second country in the world to implement a number plate scheme, after Holland did so in 1903. Initially, every local authority was given a letter, so that it would be easier to identify where a vehicle was registered. The first number plates consisted of a letter and a number, which was issued chronologically in the same order as vehicles were registered. British number plates had a maximum of four numbers until 1932, when plates began to be issued in combinations of three numbers and two letters or one number and three letters. When the numbers available began to run out, the government introduced biannual registrations, which are still in place. The latest numbering scheme was implemented in 2001, when seven-character number plates that indicate area code and age of the vehicle became standard.